today’s sketch was totally a little last minute. it was… what in the world am i going to sketch at 10pm on a monday night? why, o why, do i wait until the last possible moment when i have an entire week to do one meesly little sketch? 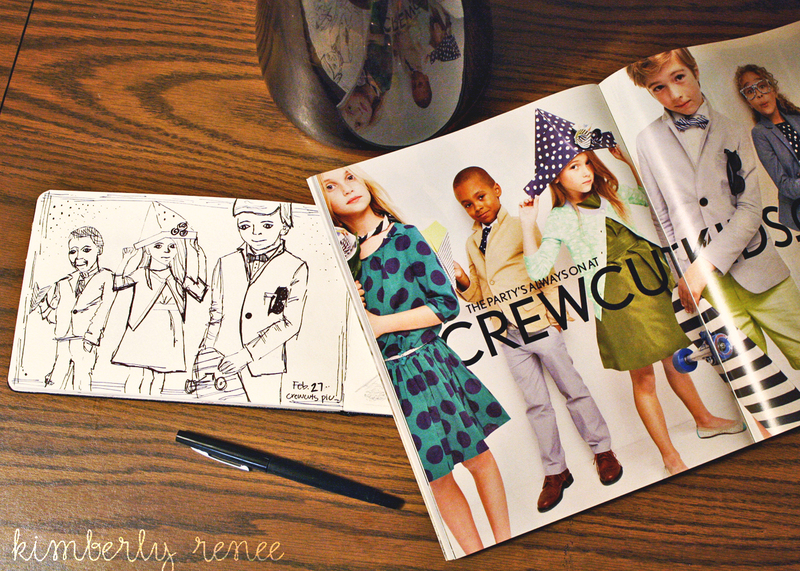 so luck would have it, the latest j.crew catalog was sitting on our coffee table. tada! i love looking at this catalog. not that i can afford anything in there. but it’s pretty and the poses that the models do for it cracks me up. they’re so… what’s the word… trying to be posh. is that a saying? does that even make sense? not really. but they’re so fashionable and they know it. even the kids for the crewcuts section. so there ya go. for this week’s sketch for tuesday, i sketched some cute – slightly posh- maybe looking a little stuck up-but know they look good- kids. maybe some day i’ll be convinced that my own little boy needs to wear a bowtie. ps. what normal person could possible afford to spend this much on a piece of clothing that their child is going to grow out of it a month?????? i’m a little amazed.